The Williamson County, Tennessee Republican Party recently emailed a newsletter with a meme mocking Rep. Alexandria Ocasio-Cortez (D-NY), drawing criticism from at least one local Republican official. The county’s GOP chair on Wednesday defended the newsletter to a local paper and blamed “the left manipulating the press” for negative coverage. “What’s your opinion on Roe v. Wade?” a text box above PBS “Firing Line” host Margaret Hoover’s head reads in the meme. Hoover interviewed the then-congressional candidate in July. 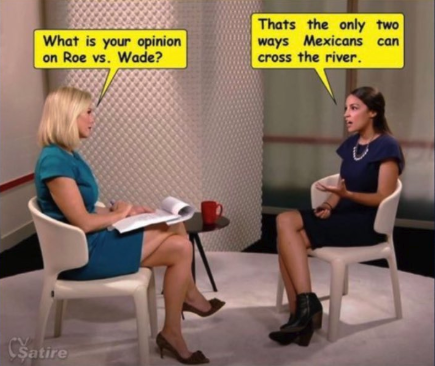 “Thats [sic] the only two ways Mexicans can cross the river,” the text box above Ocasio-Cortez’s head responds. The Tennessean flagged the meme in an article Wednesday, reporting that it appeared the newsletter had been sent by Williamson County GOP Chair Debbie Deaver. Deaver did not immediately return TPM’s request for comment. Neither did Tennessee Gov. Bill Lee (R) nor Sen. Marsha Blackburn (R-TN), who both call Williamson County home). But Deaver was defiant in an email to the Tennessean. A watermark in the corner in the meme refers to CY Satire. A Facebook page sharing that name posted the same meme on Jan. 7.